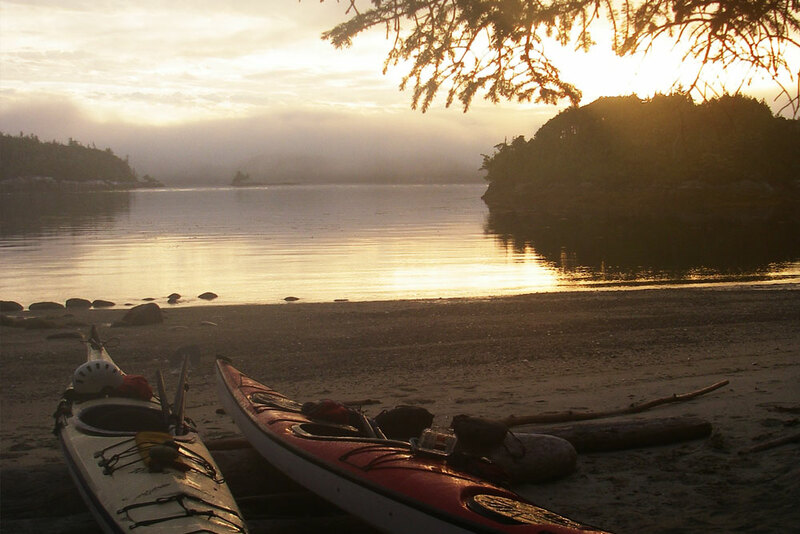 Expedition kayaking on the remote and wild central coast of BC. The Great Bear Rainforest, on the central coast of BC, is part of the largest remaining temperate rainforest in the world. 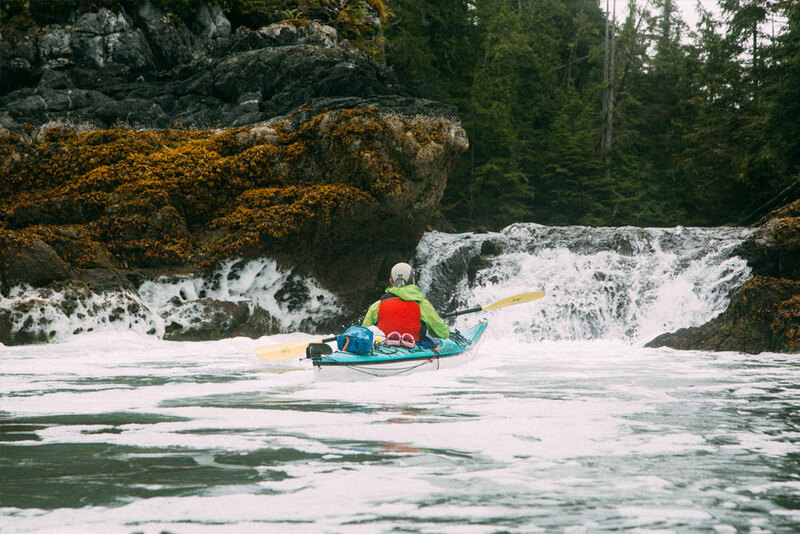 On this trip we'll head to the outer coast to explore that wind- and wave-tossed fringe that exemplifies the coastal wilderness of British Columbia. 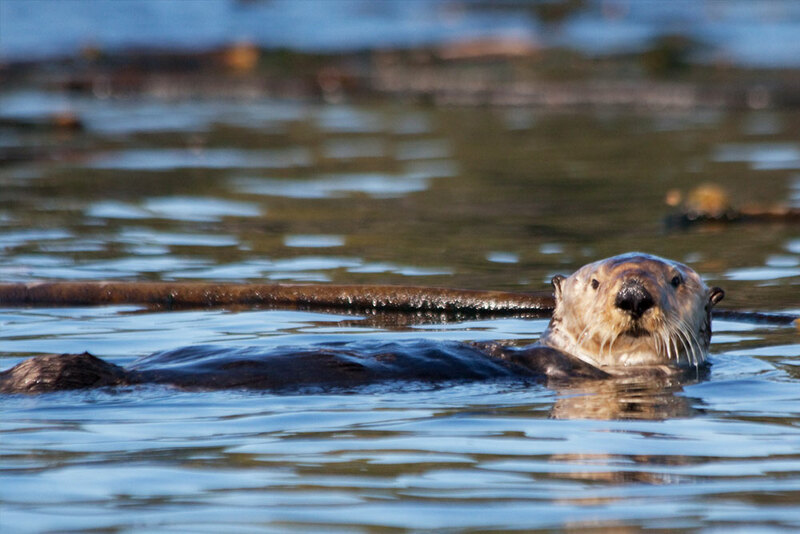 Remote beaches, whales, sea otters, wolf tracks in the sand, undeveloped campsites. 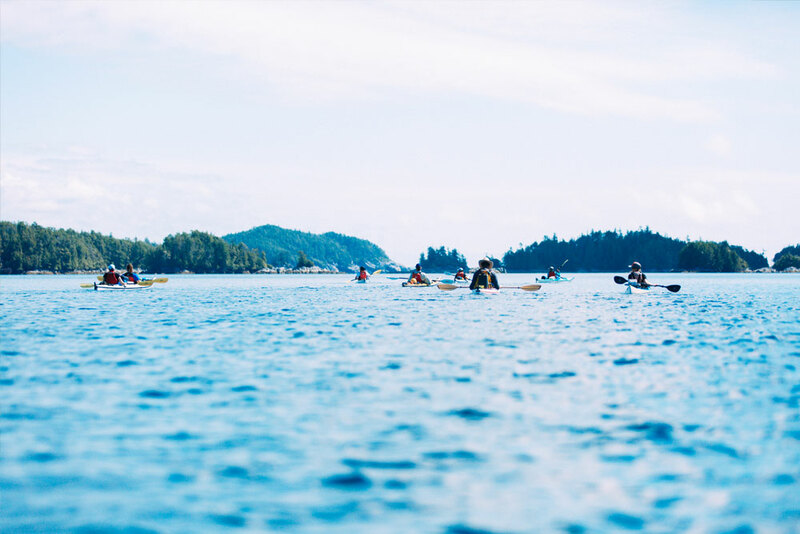 A self-supported sea kayaking expedition to the Great Bear Rainforest is perfect for satisfying your need to get away from it all. 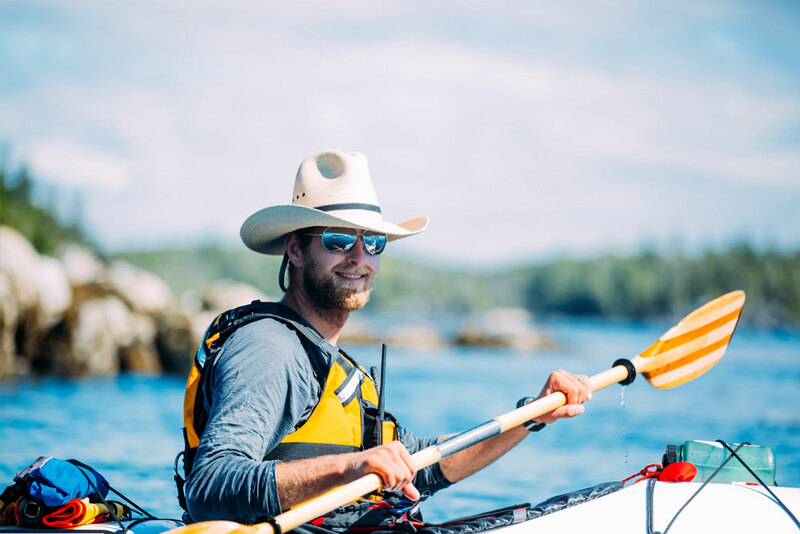 This tour offers you a chance to paddle one of the most unspoilt and unique kayak routes in North America. 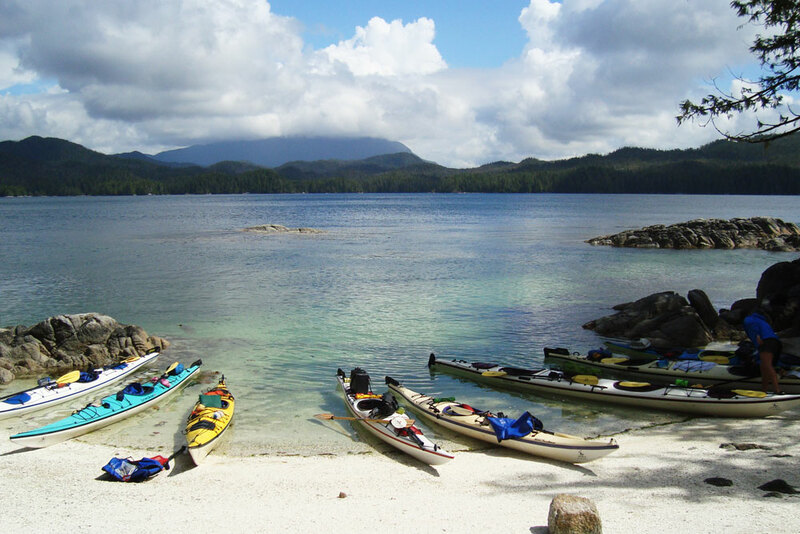 It combines travel through an area teeming with wildlife along with excellent paddling amongst the beautiful outer islands of the Great Bear Rainforest. 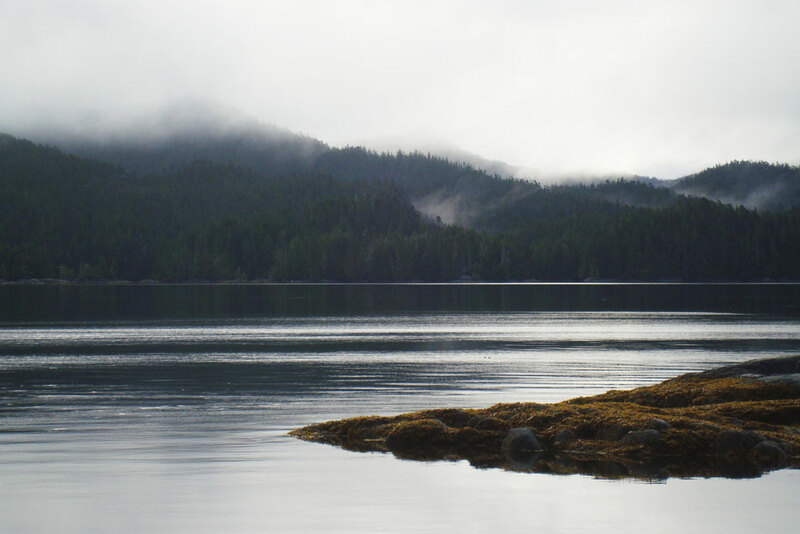 This trip takes place in the traditional territory of the Heiltsuk First Nation. We start and end this tour in the Heiltsuk community of Bella Bella, located on the Central Coast of BC (a 2.5 hour flight from Vancouver). 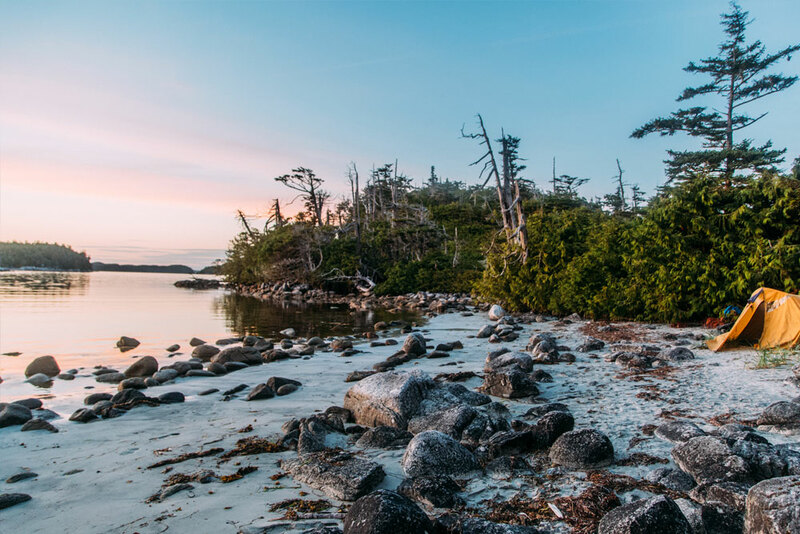 The Great Bear Rainforest is the largest intact temperate rainforest in the world which means camping amongst giant sitka spruce trees, ancient red cedars and western hemlocks that are nothing short of awe inspiring. 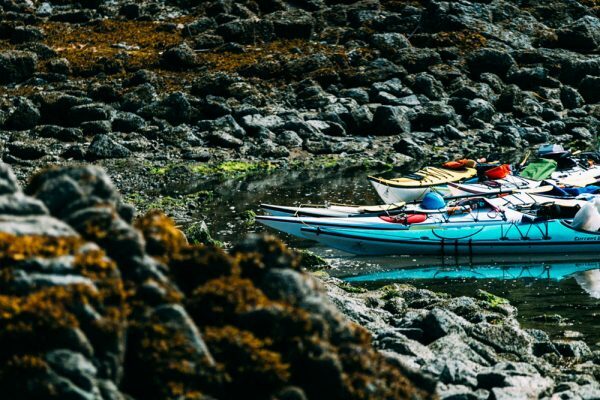 The area’s cold water and great tidal exchanges – not to mention healthy kelp forests – provide for ample oxygen in the water, supporting an incredible diversity of sea life from tiny shore creatures to majestic whales, dolphins and porpoises. 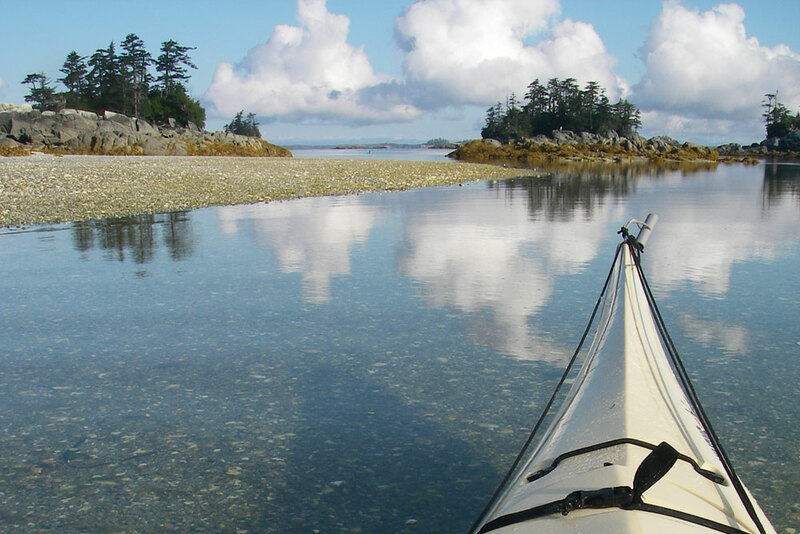 This tour aims to help you experience the best and most beautiful parts of this area by kayak. 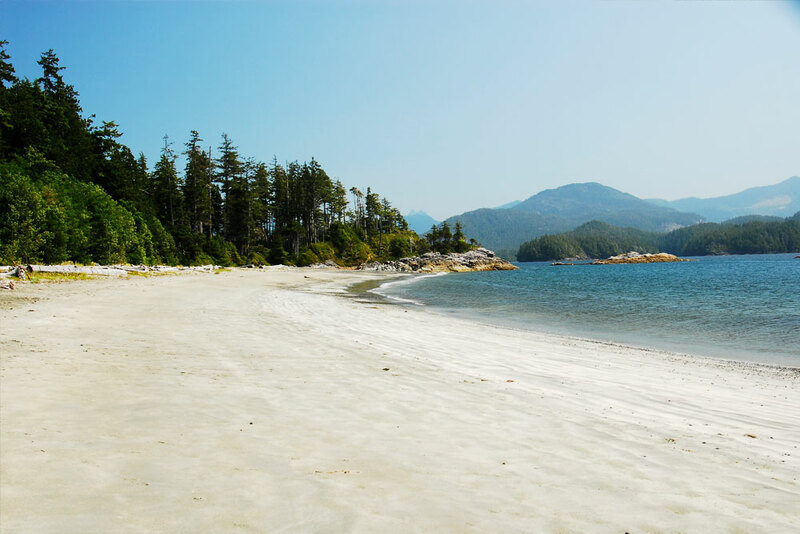 Bella Bella is a great location for starting our journey and from here we explore the intricate shoreline, beautiful long beaches, and windswept islands making our way towards Calvert Island. The water taxi transport back to Bella Bella on our last tour day means we see somewhere new and different every day of our journey, making the most of your time in the Great Bear Rainforest. Explore somewhere new each day! The Great Bear Rainforest area includes too many amazing places to explore in one trip – but in order to make the most of your time here we make use of a water taxi shuttle as part of our tour so we don’t need to spend time backtracking. This also allows us to get off the beaten track exploring some of the more remote areas and islands (weather and group permitting of course). There are so many beautiful places to stay you will be hard pressed to choose a favourite campsite. Each site has unique attributes either tucked in amongst towering forests, atop ancient village sites or overlooking wildlife rich waters. This is a true expedition style trip, which means we will move from camp to camp each day. Spirit of the West Adventures considers food to be a very important part of your tour. 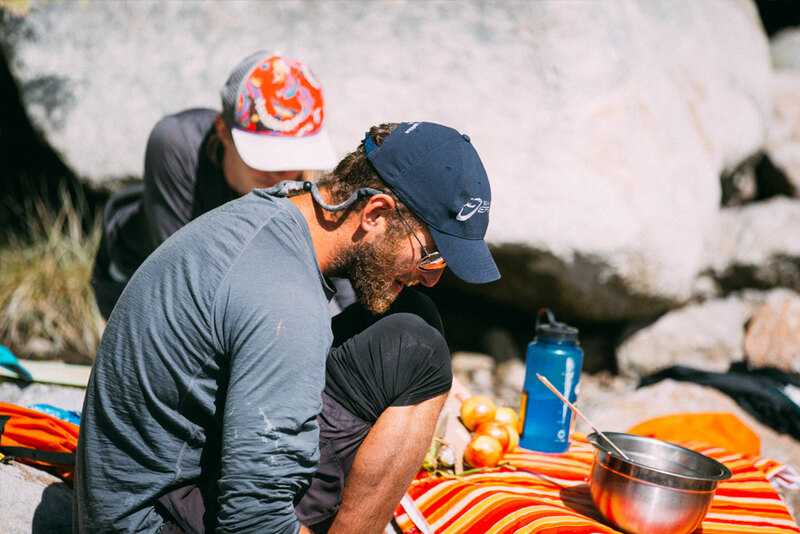 From our wild sockeye salmon dinner to our chocolate fondue and home baking for desserts there are few camp menus that compare to the one you will experience on this tour. We have a wonderful kitchen crew who ensure all dietary needs and restrictions are met, providing creative culinary alternatives that will please vegetarians, vegans, gluten and wheat-free diets, and those with various allergies and food sensitivities. Of course the food is hearty, healthy, full of flavour and fun. 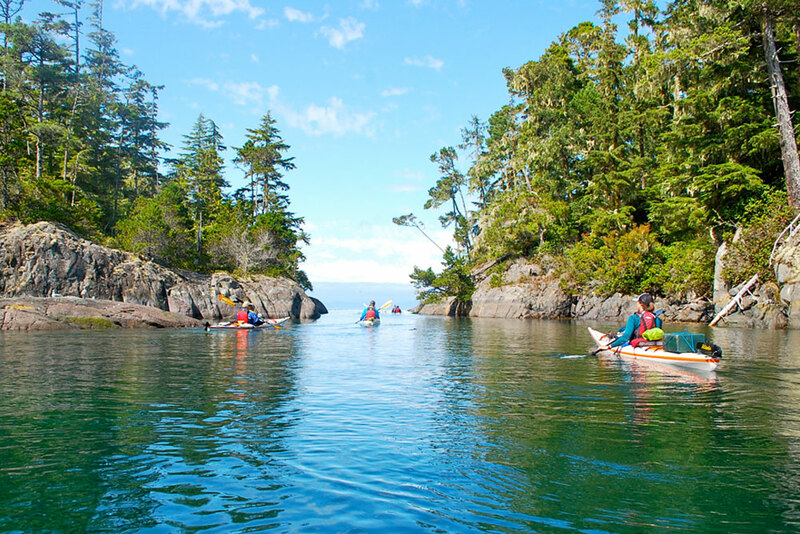 We will traverse both the relatively open waters of Hakai Passage, Kildidt Sound as well as the more protected islands of the and islets in one of the most stunning seascapes around. This area has been featured in many documentaries and publications and is part of one of the largest protected areas on the coast because of it’s stunning beauty. If you are planning on bringing any of your own equipment please double-check the packing list to ensure you have the appropriate gear and please let our office know in advance of the tour to avoid us bringing duplicates. Sleeping bags and rain gear may be rented if you prefer not to travel with them (please reserve in advance; may be booked online with your trip reservation). Spirit of the West has the privilege of operating in the traditional territory of the Mamalillikulla, 'Namgis, etc First Nations. 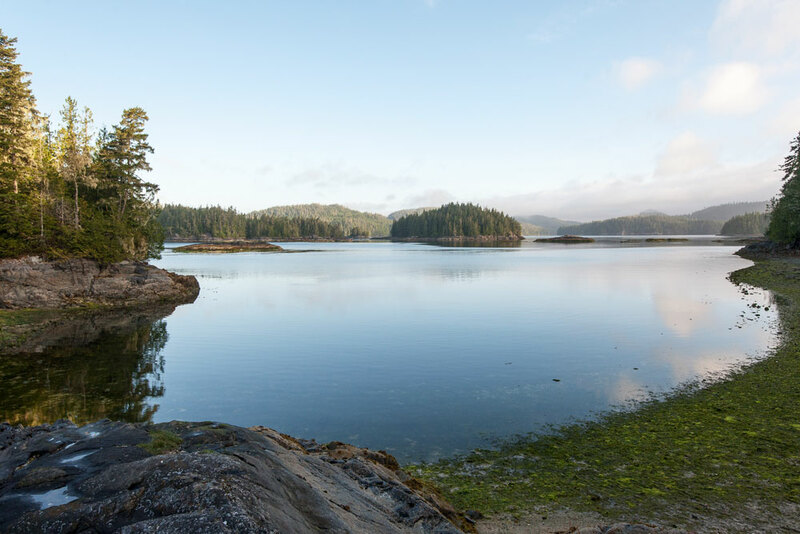 The Great Bear Rainforest Outer Islands Expedition starts and ends in Bella Bella on the Central Coast of British Columbia. The details below should help give you a fuller picture of the day-to-day trip experience. Some folks may wish to start their travel towards Bella Bella the day before the trip, however we have also scheduled the start and end dates so it is possible to arrive in Bella Bella on the day the tour starts, either via ferry from Port Hardy on Vancouver Island or plane from Vancouver or Port Hardy. Please note: If you are traveling by ferry you will likely need to spend the night before in Port Hardy as the ferry leaves Port Hardy at 7:30am, arriving in Bella Bella at 12:50pm on the first day of your trip, just in time to meet your guides. On the last day the return ferry to Port Hardy departs Bella Bella at 6:10pm and arrives in Port Hardy at 11:30pm. Ferry reservations highly recommended. (Times accurate at time of publication – please double check before planning your travel). From here you and your guides will shuttle gear to your waiting water taxi in order to pack and set off on your trip. This is the proposed itinerary for our trip, but it is flexible and may be adapted to suit the interests of those who join the trip as well as weather conditions. On this tour we can expect a combination of exposed open coastline and more protected inner passageways. As this is a expedition style tour, we usually move campsites each night. We may have an opportunity to stay in the same place for two nights, if conditions allow. 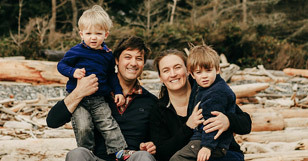 Meet your guides in Bella Bella in the heart of BC’s Central Coast. We will meet in central Bella Bella at the government dock. Here we will load kayaks and gear onto our water taxi for the shuttle out to our first campsite. Once there, we will sort out gear and prepare for our adventure, beginning with an orientation to the kayaks and gear, learning efficient paddling techniques and safety procedures. Once everyone is comfortable with their boats we’ll launch for our first strokes in the Great Bear Sea. This is a beautiful area to paddle and we work with the conditions and remain open to adventure. Each day, your guides will assess the weather, tides, and sea state to determine the destination for the day. Flexibility is key. Depending on the weather and exact drop-off location, we may plan to paddle the remote Goose Group Islands (weather depending), McMullins and Tribal Group. Moving southeast we’ll enter the spectacular islands and beaches of the Hakai Conservancy, continuing in the direction of Calvert Island. We will meet a water taxi this morning for transport back to Bella Bella. We expect to arrive in Bella Bella by midday, allowing us time for a quick visit to the village before either heading to the airport to catch an afternoon flight back to Vancouver or departing by BC Ferries. If flying you can expect to be back in Vancouver between 3 and 5pm, or if travelling with BC Ferries you’ll arrive in Port Hardy at 11:30pm. (Please note these times were correct at time of publication – please double check before planning your travel). Below is a list of commonly asked questions. If you have any further questions or concerns please do not hesitate to call us. What is the minimum age required to join our tours? call us and we would be happy to discuss the options. What is the average age of our guests? We have guests from age 5 and up on our family tours and ages 12 to 85 joining our regularly scheduled tours. The average age ranges between age 30 to 65. Each tour and tour date is different, but we usually get a good mix of ages. For those concerned with being in ‘their older years’ or anyone unsure of which tour fits them best, we welcome you to contact us and we will be happy to help you find the perfect trip. Are there any single supplement fees if I am travelling on my own? There are no single supplements. We encourage solo travelers to join us and often have several solo travelers on each tour. 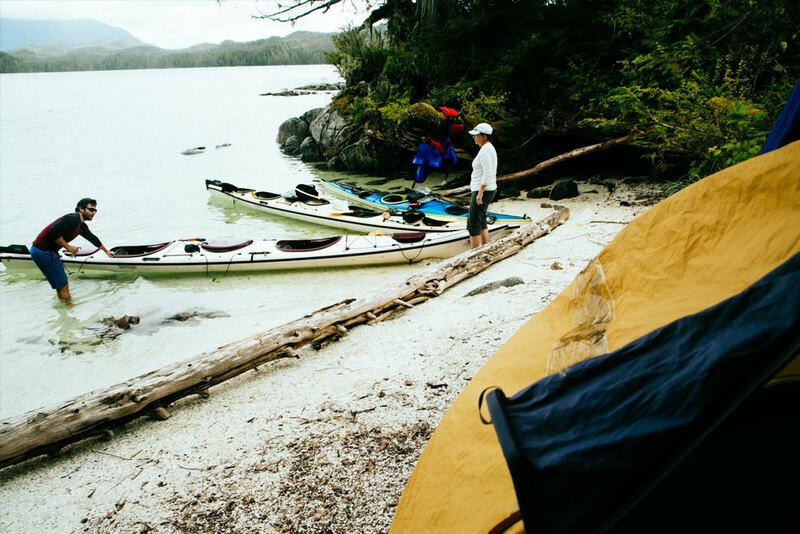 It should be no problem to have your own tent and you will have access to both single and double kayaks. Can you accommodate food allergies/special diets? Our food preparation crew are masters at accommodating dietary restrictions. We are able to offer gluten-free, vegetarian, pescatarian, dairy light and vegan menus with prior notice. Other dietary requests may involve additional charges and need to be discussed in advance with our food crew. We are NOT a nut-free facility. Will I comfortably fit in the kayaks? If you are over 6ft (182cms) tall, if you are on the more petite side of things, have larger hips or weigh over 250lbs (115 kg) we have certain kayaks that may work best for you. Please give us a call and we can ensure we have the appropriate kayak available for you. 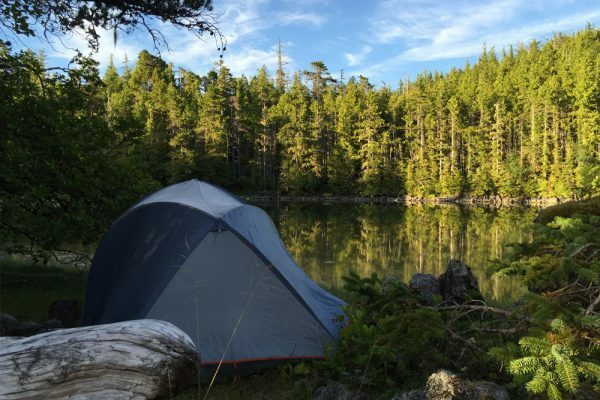 We supply everything that you will need for kayaking and camping except for a few personal items such as your clothing, toiletries, sleeping bag and rain gear (sleeping bags and rain gear can be rented if needed). 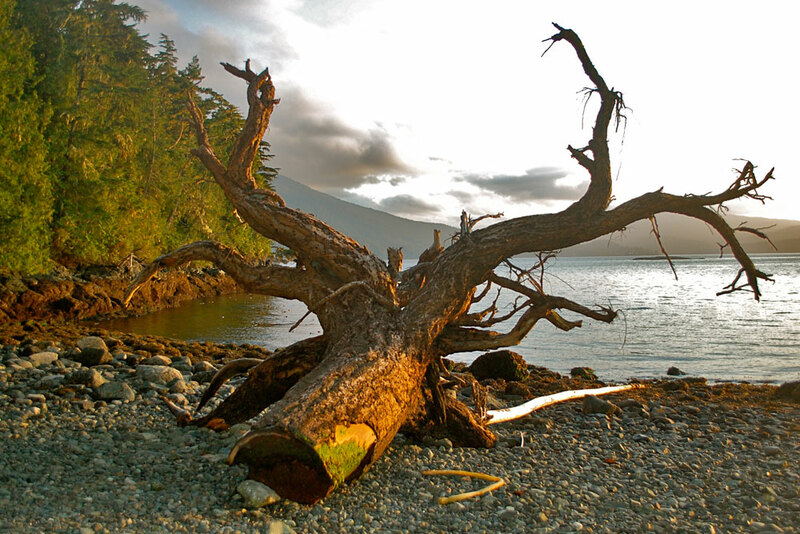 We pick you up free of charge from your accommodation on Quadra Island on the morning the trip starts and we will drop you off there when the tour is finished. We provide all meals from morning snack on day one to lunch on the last day. Non-alcoholic beverages including a wide variety of teas, coffee, juices, hot chocolate are provided. Alcohol is not provided and you are welcome to bring your favourite wine, beer or pop to enjoy responsibly. There is a grocery and liquor store very close to the location of the pre-trip meeting if you would like to pick up extra beverages on the evening before the tour. There are no additional costs once on our tour unless you wish to purchase souvenirs. We send you a complete packing list a few weeks prior to your tour to help you prepare. If you would like to see what type of clothing and items we recommend please click here and select your tour. (Please note the packing lists (page 4) between tours varies so choose the correct trip for the most accurate information). How much kayaking experience is required? Our adventures are designed to cater to all levels of experience and abilities from first-timer to expert paddler. We have several different styles and lengths of tours so that everyone can find the perfect trip. 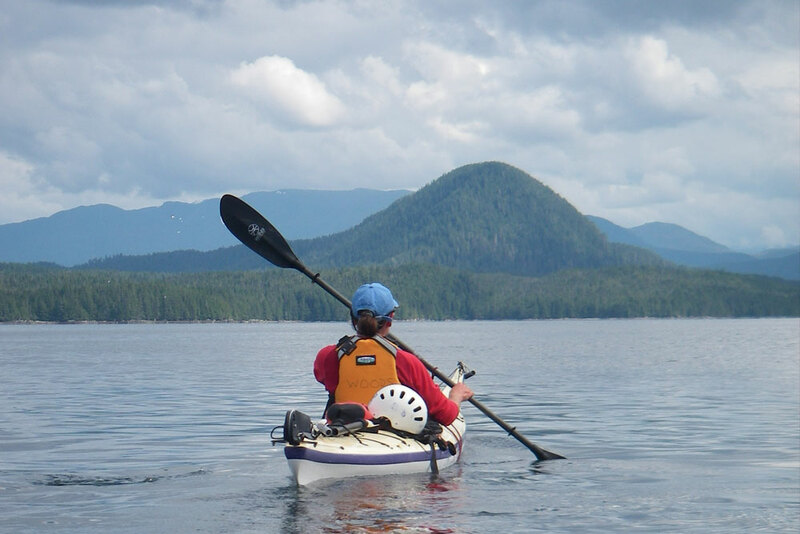 If you are new to kayaking and camping check out our base- camping style tours- the Whales and Wilderness Glamping and Johnstone Strait Ultimate tours. If you are looking for more rustic camping and more paddling check out our expedition style tours; the Great Bear Rainforest, Johnstone Strait Expedition, Orca Lite, Nuchatlitz or Desolation Sound tours. Do I need to be in great shape for this trip? The Great Bear Rainforest tour is considered moderate in nature and requires a moderate level of fitness. If you are capable of a few hours of moderate exercise each day with possible short periods of increased exertion you should have no problems. Keep in mind that good general health will go a long way if we happen to encounter some strong winds or time restrictions. Most important is an adventurous spirit. Please check with your doctor if you have any particular concerns. 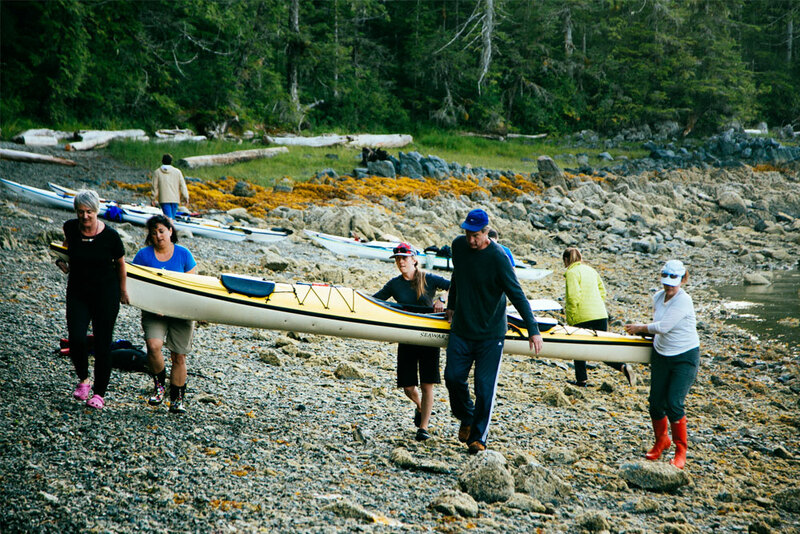 Paddling time will vary depending on the trip, our destination, weather conditions and the group’s abilities and desires. Generally, we travel between 4-7 hours a day on our expedition tours, not including breaks and lunch We set a pace which is manageable and enjoyable for all. The kayaks we use are stable and designed for comfort. Your guides will give you through instruction on how to safely use and enjoy the kayaks and what to do in case of a capsize. For those concerned about capsizing, the double kayaks are slightly more stable than the singles and we have a variety of both singles and doubles on every trip. The likelihood of a capsize is minimal and if it does happen your well-trained guides will be there before you know it to help. In the rare event of a capsize, all of our guides are trained in rescue procedures in order to quickly and efficiently get you back in your boat. At this point, we will take you to the nearest shoreline to change into some warm clothing and carry on with our journey when you are ready. While we are out on the water, it is of the utmost importance that the group stays together for safety. If the weather turns bad? Will I be comfy and warm? Our weather in the Pacific Northwest is generally pleasant from May through until September. The temperatures on the Central Coast will be cooler than the Vancouver area. Fog is very common on summer mornings, however, this nearly always clears at midday. Although it is uncommon, it can rain in the summer, be prepared for any type of weather and you will stay comfortable. Layering is the key. It allows you to put on or take off layers while on the water if you need to. If you are very concerned about the weather then we recommend our base-camping style tours as these campsites have covered eating and lounge areas as well as dry tents to come home to at the end of every day. On our expedition style tours, we carry tarps but we are a little more at the mercy of mother nature in these more rustic style campsites. What sort of wildlife might we see? 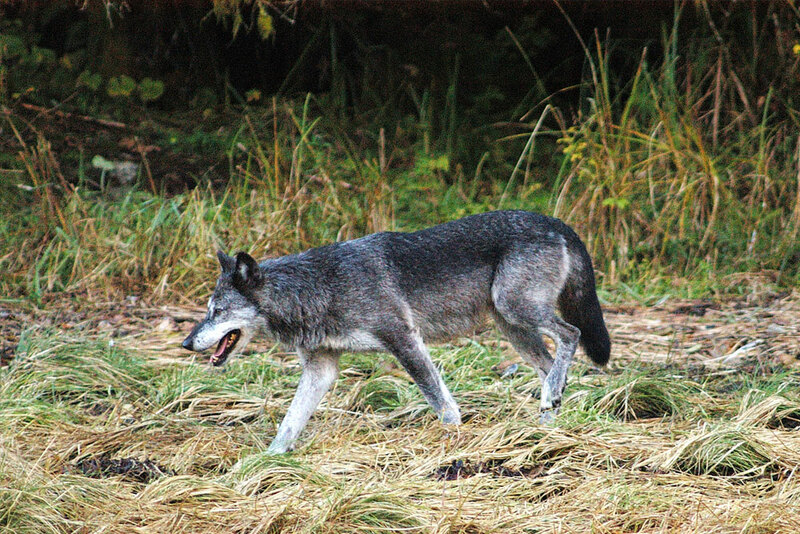 The diversity and abundance of wildlife in the Pacific Northwest is one of our great privileges. 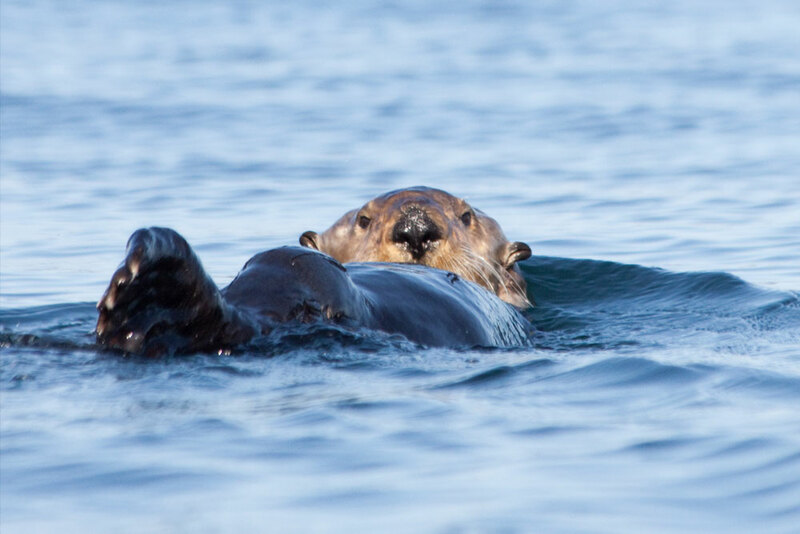 From the rich marine life of colourful plants and invertebrates, seabirds, shorebirds, waterfowl, mink, otter, seals, sea lions, dolphins, and whales, to the land animals of deer, raccoons, cougars, wolves, and bears, we are bound to see something. For those with an eye for eagles take note that they are most prominent in the earlier months before the salmon migration in the late summer/early fall. For those keen to see humpback whales- you are in luck. The population of humpbacks in our area is doing well and we are fortunate to often see these whales any time of the year. If Orcas are your main priority then we recommend traveling between mid-July and mid-September. While it is possible to see orcas outside of these times, we see them with the greatest abundance and frequency during this peak period. Please just remember that wildlife is just that wild and we cannot control sightings. That said the whales are the icing on the cake in this stunning, rich and diverse area. Where is the best place to see orcas/killer whales? 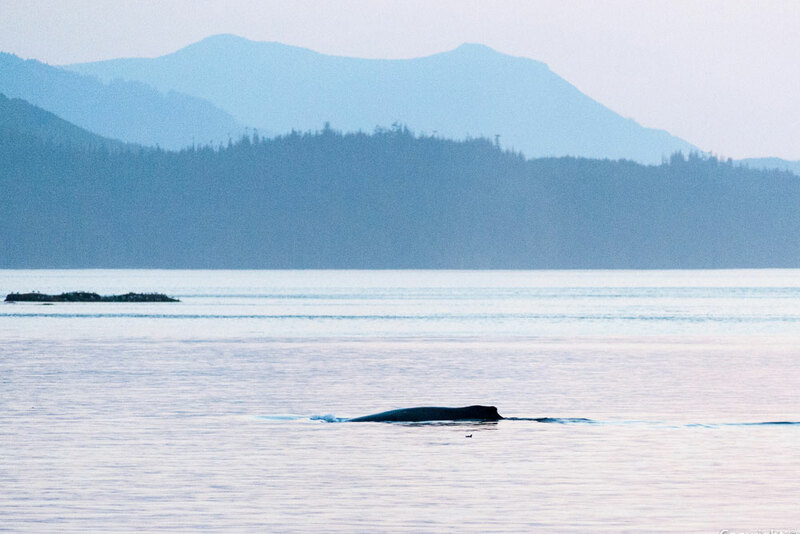 On our tours to Johnstone Strait and Blackfish Sound, which includes the Whales and Wilderness Glamping Tour, the Johnstone Strait Ultimate, Family Orca Tours and Orca Lite tours, we stand a high chance of seeing whales, especially between mid-July and mid-September. Understandably we cannot guarantee what nature will dictate, but we can tell you that this area has one of the highest concentrations of Killer Whales on earth and this is where they spend their summer holiday. Some trips view the whales from the kayaks, some while traveling on our water taxi or from our campsites on the shore and some see all of the above. 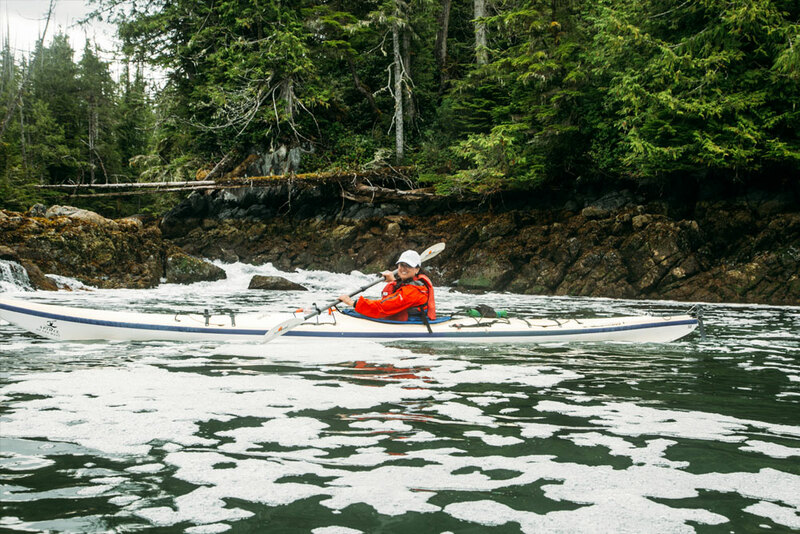 How close to we paddle to whales & other wildlife? 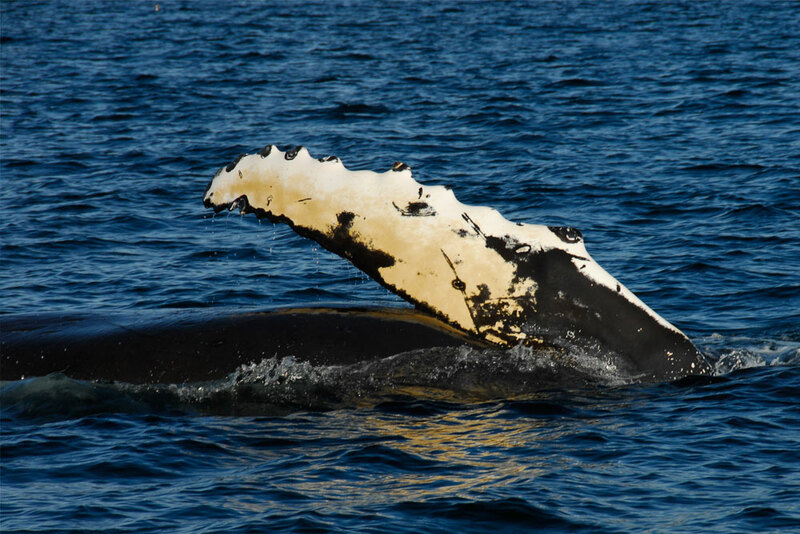 We do our very best to provide awesome sightings of whales but all the while ensuring that we do not disrupt the natural behaviour of all the wildlife we encounter. We abide by the Canadian whale watching regulations which means we do not approach killer whales (orcas) any closer than 200 meters (656 ft) and all other cetaceans no closer than 100 meters (328 ft). To learn more about how we do our best to minimize our impacts on whales check out nimmsa.org the North Island Marine Mammal Stewardship Association. Your trip fees help to fund whale research and conservation efforts through the NIMMSA fund which Spirit of the West Contributes too. What is the camp setup like? All of our campsites are in wilderness settings, and shelter is provided by the tents and tarps we carry with us. We seek out sites with beautiful surroundings and those that offer solitude; these are all undeveloped and may be clearings in the forest or space on the beach. There may be times (on occasion) when we are camping next to another group of kayakers. Campsite choice will be based on weather conditions, route choice and group size and preference. There is very little fresh water to be found. Therefore, seawater is your best bet for washing up. Please use biodegradable, environmentally friendly soap brands. Toilet facilities are not common in most wilderness settings, although some areas may have pit toilets. We also carry a portable toilet system. Your guide will generally designate an area that works for ensuring your privacy. We are very accustomed to making sure all of our guests feel comfortable and informed – please feel free to ask us any questions you might have, before or during your tour. Where can I leave my luggage I won’t need on trip? If you are staying in the Bella Bella area before and after your tour, please check with your accommodation to see if they can store your bags. We will also have a Spirit of the West Van in Bella Bella in which you can leave luggage, but please note this is at your own risk. Consider bringing small valuables with you on the trip (eg. passports) or leaving large valuable at home (eg. laptops). If you would like to express your appreciation to the guides through a gratuity, such recognition would be enthusiastically received. The industry standard for tipping is approx. 10% per person of the trip cost. All tips received will be collected and disbursed amongst your guides & base crew by the trip leader. 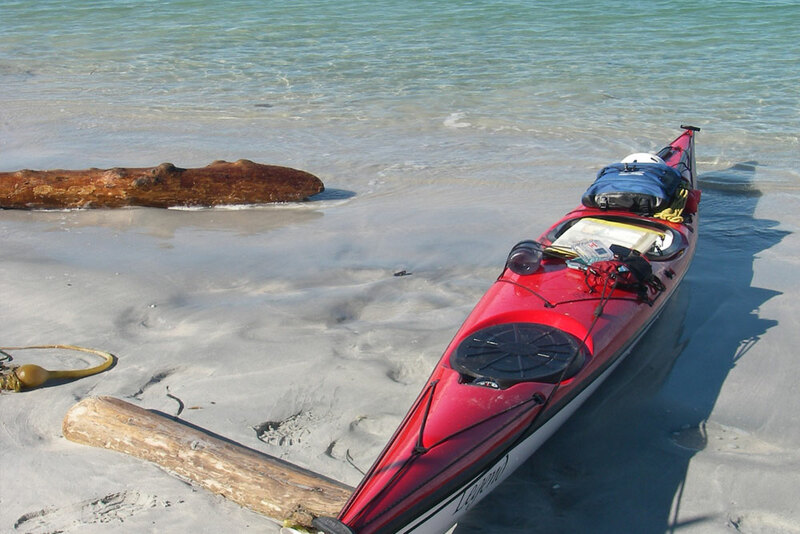 “Great bear expedition is a must for serious kayaker. 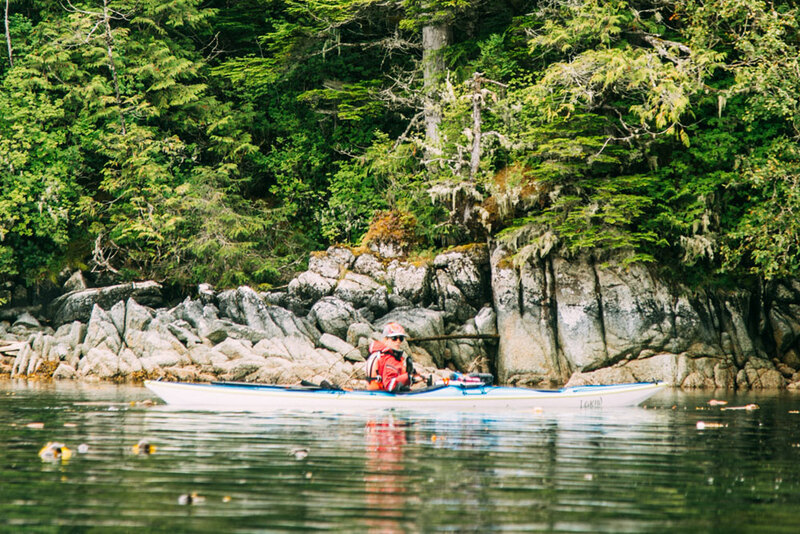 8 days in the Great Bear Rainforest (Hakai Conservancy) are about as close to west coast kayaking heaven as one could get. This was an amazing opportunity to kayak in this wild and magical land. As usual, the SOW arrangements for food and equipment were excellent. Wind, rain, ocean swells, beach camping are all part of the challenging fun." 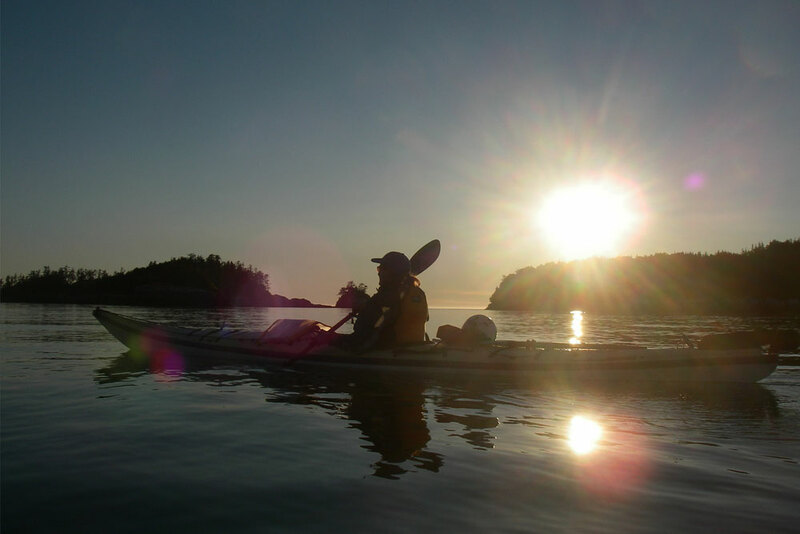 "We really enjoyed the SoW kayak trip in the Hakai area of the Great Bear Rainforest. This region is so remote and unique, it was a real opportunity to visit there. The white sandy beaches, big crossings and canal-like channels were amazing. This is our fifth trip with Spirit of the West and all of them have been great. The routes, the guides and the food are excellent." "The guides were fantastic, the communication before the trip was great. Everything was well organised. I can't fault anything. A highly recommended trip and company to do it with." "One of the best experiences of my life , very professional guides , amazing food and a brilliant trip , well done Spirit of the West Adventure." "Great campsites in very remote places in between a lot of wildlife. We were just spoiled of good kayak equipment and the best guides you could imagine who made the best food after a nice day kayaking. Everything was so very well organised and planed! 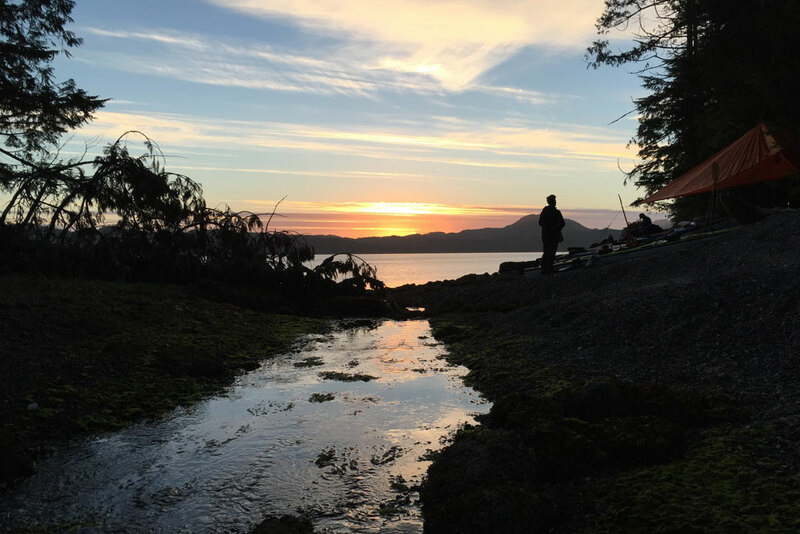 Thank you..."
On the Great Bear Rainforest Outer Islands Expedition we will be packing everything into our kayaks each day in order to travel to our next campsite. While space is limited, please ensure you bring enough to stay warm and dry. The following is a list of suggested items that should keep you a happy camper. Sea kayaks are oddly-shaped vessels to pack, so the key is to pack into the small compact bags which we provide. (The video to the right also provides some practical, and humorous, tips and tricks you might appreciate). Sea kayaks are basically watertight, although small amounts of water may get in through the rudder lines and hatches. In the event of rain or dropping gear in the water we try to keep things as waterproof as possible. We provide you with waterproof storage bags also know as ‘dry bags’ (these will be given to you when we meet in Bella Bella). If you prefer to bring your own dry bags, please note the largest bag should not be larger than a sleeping bag or 20 litres; several small bags are best. We will provide one 5 litre, two 10 litre and one 20 litre dry bags for you to pack into. Additional bags may be available depending on space in the kayaks. The 5 litre bag is good for storing small items such as cameras, sunscreen, glasses, etc. The larger ones will be used for storing the rest of your clothing. Please see our suggestions for waterproofing your sleeping bag. Shoes can generally be packed loose in the kayak. All participants will also pack some of the group gear and food in their kayak. Don’t worry, it always looks like an impossible mountain of stuff to fit in the kayaks, but with some perseverance and coaching from your guides we always manage to fit everything. Please note that our summer temperatures from July until September are generally quite comfortable with temperatures from 18-30 degrees Celsius / 70-85 degrees Fahrenheit. It’s not uncommon to find mid day summers hot enough to want to cool off in the ocean! June and later September will have cooler temperatures, and at ANY TIME OF YEAR we can have rain & wind, with temperatures occasionally as low as 13 C / 55 F. So, we say it is best to come prepared for any type of weather. If you have your own gear and would prefer to use it on your tour, please bring it to the pre-trip meeting so that we can make sure it is suitable and meets safety requirements. The following is a list of suggested items to bring along. If you have any concerns or questions about the list, please don’t hesitate to contact us. Sleeping bag – A 3-season synthetic bag is recommended. Down bags will work but please take extra care to waterproof. If you are uncertain about whether or not you have the appropriate bag just give us a call or check with your local outdoor store. If you do not have a sleeping bag or would prefer not to travel with one, these may be rented for $25 plus tax. Please reserve in advance. To waterproof your sleeping bag line a compression sack with a heavy duty garbage bag. Press the air out of the bag with your knee and then keep it compact with the compression sac (may be purchased at any outdoor shop). This also helps keep your bag small for travel. Wetshoes – A pair that can get wet such as sturdy full strapped sandals (such as Keens, Tevas or Chacos), neoprene booties, crocs, or rubber boots. Please avoid flip-flops/thongs. Spirit of the West has a wide range of rubber boot sizes (youth – men’s size 13) available to borrow free of charge if you don’t have your own wet shoes or have limited space in your luggage. Please arrange these in advance as we won’t have a selection with us in Bella Bella. Camp footwear – An additional pair of footwear that you plan to keep dry. Runners, trainers or light hikers are great. Hat – A sun hat such as a baseball hat or full-brimmed hat as well as a wool or fleece warm hat for evenings or cooler days. Sunglasses & sunscreen (stored in a Ziploc bag) – A must for protection from sun and glare off of the water. Safety cords on your glasses are highly recommended. Small flashlight or headlamp – With spare batteries. Headlamps are preferable as they allow for hands free operation. Camera – In a waterproof bag or case, or you may use our dry bags. Personal items – Toothbrush, toothpaste, biodegradable soap/shampoo, washcloth, feminine hygiene products, hairbrush, etc. Medication – If you are bringing medication please ensure that… 1) The name and expiry date of drug is on the container; 2) You have the detailed instructions of your dosage and frequency; 3) It is packed in a water and sunproof container; 4) You bring a full extra dosage of your medication in a separate container to leave with your guide, in case you misplace or lose yours, or are weathered in. If you are flying, please pack all necessary medication in your carry-on luggage. This will help eliminate some stress should your checked bags be misplaced in transit. Mosquito repellent – Insects are not a significant concern for us in our coastal ecosystem, however for those unused to insects or with particular sensitivities some repellent may come in handy. Ziploc bags & several large garbage bags – We will provide you with dry bags, but these come in handy for transporting laundry and/or wet clothing. Water bottle – Bike bottles or Nalgene-style bottles work best. Gloves (optional) – Biking gloves work well to protect your hands from blisters. If you are really concerned abut cold hands, and are paddling in the spring or fall seasons, you may want to invest in neoprene gloves or pogies. Beverages – We supply a wide range of teas and coffee as well as juices. You are welcome to bring along soda pops or alcoholic beverages if you choose to. Please note however that we do expect our guests to consume alcoholic beverages responsibly and strictly enforce a no alcohol on the water policy. Gratuity for your guides – at your own discretion. Clothing should be suitable for the time of year, bearing in mind that it could become cold and wet at anytime of year. Layering is the best way to regulate body temperature and maintain warmth. We suggest avoiding cotton (except for those hot days). Cotton has no insulation value when wet. An inner material that wicks moisture from the body and gives a comfortable dry feeling even while wet is the best first layer (Polypropylene, Lycra, Nylon, Polyester). A synthetic material such as fleece or pile makes the best second layer to provide warmth. Wool is also suitable. Rain jacket & rain pants – For the unexpected nasty weather. To test your waterproofness – jump in the shower and see if you stay dry! (we’re serious!). If you would like to rent/hire rain gear from us, please reserve in advance of the tour. Tops and bottoms can be rented for $25 plus tax for the set. Long pants – 1 pair of fleece or warm comfortable pants. 2 lighter pairs made of a quick drying, synthetic fabric. Athletic style pants (running or yoga) are generally appropriate. Jeans are NOT recommended for paddling. Lightweight long underwear – 2 pairs, helps to keep you warm at night or as a base layer during the day. We recommend one set for kayaking and one set which is reserved for sleeping and always stays dry. Sweaters – 2 warm wool or fleece sweaters (one may be all you need, but it is nice to have a spare in case one gets wet). T-shirts – 2 or 3. An extra set of clothes that you may want to reserve for the end of the trip. Our online booking system allows you easy access to booking your tour with Spirit of the West Adventures, any time of day. If you think that you would like to book a trip, but need time to look into other travel arrangements, please contact our office and we will place a temporary hold on your spaces.